Chicken dinner for two costs less than $10.00! This meal is so affordable and easy to put together. Watch your Sunday grocery store flyers, when chicken thighs, bone-in, are on sale and go buy a few. They are usually around $2.00 lb. Our local grocery has them today for $1.79 lb and I got a 3 lb package which will give us 2 meals, dinner for two and lunch for one of us. It was $5.37 for the package. I like bone-in and skin-on because it gives the meat more flavor, keeps it moist and costs less. Bok Choy is very affordable; you can get a stalk or two which is plenty for dinner at around $2.00. Brussel Sprouts have the biggest spread in cost. I've seen them for as little as $1.50 a pound or as high as $4.00 lb. One pound is more than we eat in one setting even when I’m making a salad with them. The sprouts and bok choy are only examples, use whatever veggies your family enjoys. The point is it doesn’t cost much to eat really well. Mulberry, they are just as good as blackberries! If you live in the mid-west this is a stellar year for Mulberries. My trees are hanging to the ground they are so heavy with fruit. Mulberries are over looked for some reason, it might be because their flavor is more subtle than the blackberry but they are still good and really good for you! And they don't have seeds like the blackberry which I think is a big bonus. They also grow on trees so you are not bending over the whole time you're harvesting them. If you are like me you eat as many as you put in the container while picking them. They are quite yummy. They freeze nice so you can pick them on a beautiful afternoon and make them into jelly or pies when the weather gets a little cooler and you want to warm your home with the stove and the sweet aroma of this delicious fruit simmering. The FDA announced last week they are asking food manufactures for a voluntary reduction of the sodium they add to processed and prepared foods. Dr Frieden, the director of the C.D.C, wrote in an editorial published in The Journal of the American Medical Association; that a decrease in sodium intake by as little as 400 milligrams a day could prevent 32,000 heart attacks and 20,000 strokes annually. He stated that Britain has lead the standard for voluntary sodium reduction since 2003 and by 2011 sodium intake dropped by 15% and so did their populations average blood pressure and deaths from ischemic heart disease and stroke. Sodium is the main element of table salt and is added to most processed and prepared foods. The average American adult consumes 3,400 milligrams a day the equivalent to about 1.5 teaspoons of salt. That is nearly 50 percent more than the 2,300 the federal government recommends. You may have heard or read in the headlines the past couple of days about the USDA asking food manufactruers to voluntarily reduce the amount of salt in food. Research has shown that most sodium in the U.S. diet comes from commercially processed and restaurant foods and that sodium reduction in these foods is key to public health efforts. The obvious way to reduce your intake of sodium would be to cook at home more often. Here is a link to my FREE recipe book to get you started if you are interested. Another way to reduce your sodium is the type of salt you eat. Spring is here at last in Ohio. The birds are building their nests and singing bright and early each morning. 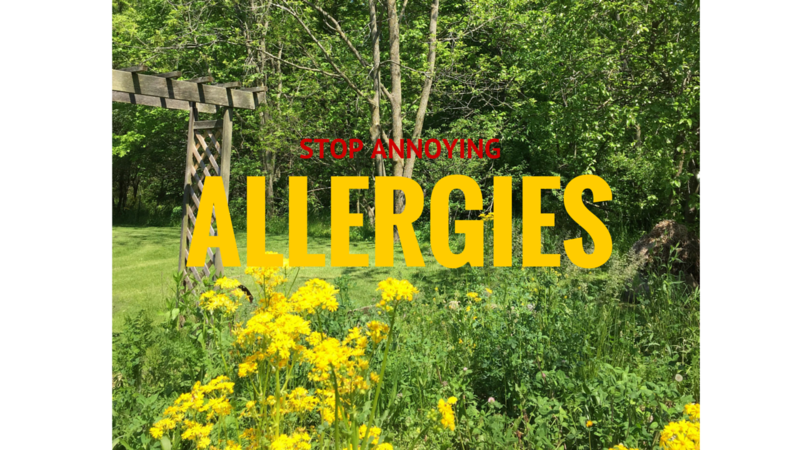 The flowers and trees are in bloom and so are seasonal allergies. Do you have itchy eyes and a drippy nose? Are you fed up with fits of sneezing? You might be like millions of others whose immune system is over reacting to all of the pollens floating in the air. Don't feel defeated!! Here are several ways to boost your immune system and ward off those annoying allergy symptoms and it starts in your gut. * Drink a glass of warm water with the juice of half an organic lemon first thing in the morning. This starts your digestive system by increasing your bile and helping to balance your ph.